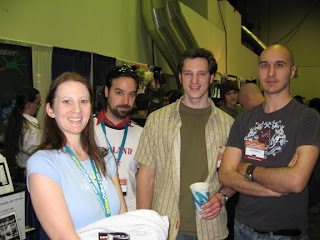 from left to right: Amy Wolfram [writer], Serge LaPointe [inker], Steph Peru [colourist] and Karl Kerschl [artist]. The whole team behind TEEN TITANS: YEAR ONE gathered at the Monkey Sweatshop booth (booth A116) at the New York Comic-Con! Amy Wolfram made it to New York from the West Coast, in her first con trek outside of San Diego. Many Titans fans will know Amy from her excellent work on the Teen Titans animated series; Amy crafted winning episodes like SISTERS, TERRA, BETROTHED, CALLING ALL TITANS and THINGS CHANGE. She'll be bringing the same character depth and whimsy to the Titans with the year one mini series! Amy's got some awesome insights into the original fab five. This should be a joy to read. The art on the book looks to be nothing short of fantastic. The team is looking to achieve a sort of 'animated' approach. Karl's style is a little bit looser and freer - giving the book a kinetic and youthful look. Once Karl draws it, the foreground characters and images are inked by Serge LaPointe. The inked/penciled pages are then scanned in, and the whole thing is colored by Steph Peru. 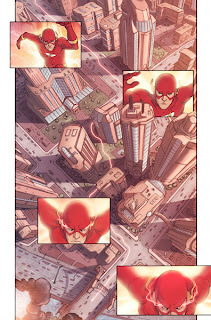 Steph takes the penciled backgrounds, and digitally colors them. Once that's done, Steph also adds lighting and shadows. The whole combined effort has a rich, lush look that reminds me of things like PRINCESS MONONOKE or a Disney film. The overall effect is something like this sample FLASH page. The team is putting in a HUGE effort, and it's gonna come through on the printed page. Man, this book is going to be sweet! Look for TEEN TITANS: YEAR ONE some time toward the end of 2007. Big thanks to Amy, Karl, Serge & Steph for being so gracious!